SAN FRANCISCO—Chief Justice Tani G. Cantil-Sakauye will continue her month-long focus on civic learning with a visit to the C.K. McClatchy High School’s Law and Public Policy Academy in Sacramento on Thursday, February 21, 10:00–11:00 a.m., where a student panel has been selected to ask the Chief Justice questions. The visit comes as a follow-up to the Law and Public Policy Academy’s attendance at the Supreme Court’s oral argument session in San Francisco on Wednesday, February 6, where the students heard two cases being argued before the court. The visit is latest in a series of student outreach programs by the Chief Justice and the Supreme Court to improve public understanding of the state court system. The Law and Public Policy Academy at C.K. McClatchy High School was created two years ago. Students take core classes together and supplement their schedules with elective courses. The goal of the program is to provide experiences engaging to students and a rich curriculum centered around the law, augmented with guest speakers and field trips. Research has shown academy-style learning promotes academic success, produces more high school graduates, and leads more students to pursue higher education. The visit to C.K. 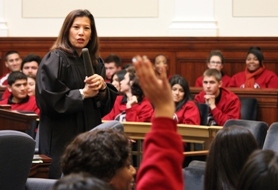 McClatchy High School is part of a month-long program by Chief Justice Tani G. Cantil-Sakauye to raise awareness about the importance of civics to our society and to focus attention on the need for civic learning in California. Thursday’s visit follows a special oral argument session at the University of San Francisco School of Law on February 5 where law students were joined by high school students from Balboa High School Law Academy and Thurgood Marshall High School in San Francisco. The C. K. McClatchy’s Law and Public Policy Academy visited the Supreme Court in San Francisco on February 6 and the Chief Justice visited Sutter Middle School in Sacramento on February 8, the University of La Verne Law School in Ontario on February 11, and Balboa High School Law Academy in San Francisco on February 13. The month of outreach on civics education will culminate with the Civic Learning California Summit: Making Democracy Work in Sacramento on February 28 where the Chief Justice will be joined by U.S. Supreme Court Justice Sandra Day O’Connor (Ret. ), Secretary of State Debra Bowen, State Superintendent of Public Education Tom Torlakson, and others interested in civic learning.